Fall/Autumn doesn’t seem to be such a big deal over here in the UK…. or at least not for me. I love the season but we don’t exactly celebrate it. There’s no big Thanksgiving feasts or anything like that. And pumpkin, to me, is quite a new thing here. But from a food perspective my favourite food at this time of year is Lobscows. It’s pretty much just a lamb stew although you can make I tend to make it with stewing steak (only because I don’t like lamb really!). I’ve not made it in a while and as yet haven’t made it this year yet. When I make some I will post my recipe and method but in the meantime check out the recipe over at Bwydlyn’s site. What is your favourite Fall/Autumn recipe? I only discovered pumpkin after I moved to Germany – I obviously knew it existed, but we never used it at home. My favourite autumn recipe has to be cottage pie. I always think of it as an autumn recipe because that’s when it starts being cold enough to enjoy it again 🙂 And of course baked potatoes are an autumn food (we always had them on bonfire night). I really like lamb but it’s soooo expensive here in Germany so I tend not to buy it. Yeah not sure why pumpkin isn’t so popular in the UK. I’ve been told it’s nice though. Mmmm cottage pie! Love cottage pie! It is definitely on my Autumn food list! That and soups! Lamb is expensive over here now as well. Is it even more expensive in Germany? We bought a leg of Welsh lamb last summer and it cost us £25!! yummmmmmmmmmmmmmmm that looks so good! And I can’t believe fall/autumn doesn’t really exist over there! I figure it must be better than fall in Texas, right?! It is so good! It’s even better as leftovers the following day though. Well of course we have the season over here but not really celebrated. I love the colours this time of year. I absolutely love lamb, but love steak too. 😉 Cool dish! I’m not sure why I don’t like lamb especially since it’s Wales signature meat! 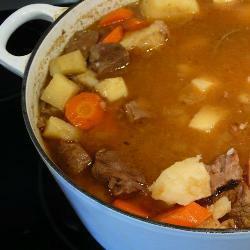 The stew looks good, I need to try it! It’s lovely! Especially with some bread and butter.